Introducing the GaryWear Active Brief PUL (Poly Urethane Laminate). GaryWear Active Briefs in PUL (Poly Urethane Laminate) are designed to fit snugly over disposable diapers for an extra layer of protection around the clock. You can also use them with trimmer fitting reusable cloth diapers. Unlike most of the other styles of plastic pants we sell these have a much slimmer cut, making them less bulky, more form fitting and discreet. PUL is a waterproof barrier material that keeps liquids in, yet allows air to circulate and thus prevents heat buildup which can cause skin irritation. If your looking for a trim fitting incontinence pant you are going to appreciate these briefs. Available in 6 Great Colors. With our new ActiveBrief, it’s all about finding the right fit. 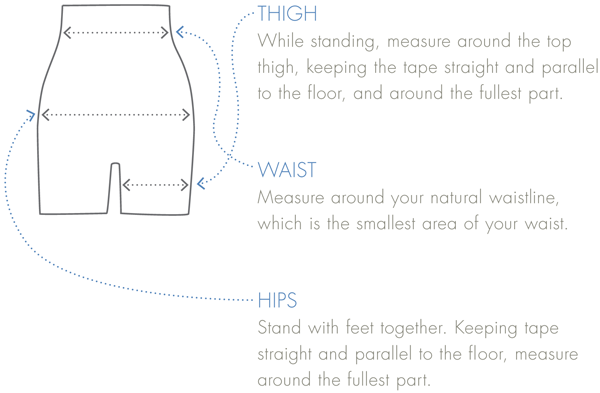 Start by measuring your thigh, as this the most important measurement for preventing leaks. Gary active briefs are a perfect diaper cover for my disposable diapers. Love to wear them daily! "Recently I bought some Gary active briefs PUL. They are the best. Letting air through, but being water-tight makes these pants far superior to normal plastic pants. <br>I know I will be ordering more." Fit great over my disposable diapers and much cooler than plastic. I did not find them any quieter than the plastic Leak Master I normally buy. Even if they don't last longer than the plastic Leak Master, they are worth the extra cost for warm weather wear. I will be buying more. I too bought these for wearing over my disposable diapers. I bought them one size too small for a snug fit which is good but not tight. They are much much better than plasticized nylon or simple plastic pants. Bought one white and one black. No difference in size. They are really functional over disposables. I loved these pants in white but when I bought them in navy they were much smaller. So order the next size if you want the pants in color. Why no "pastel blue" version? Very good product, comfortable to wear for hours. <br>However, wondering why no "baby blue" or "blue pastel" versions? They provide pastel pink but no versions in pastel blue. Enjoy color matching. <br>Our Response: The material manufacturer does not offer that color but we passed on the request. These are my go-to diaper cover for night time use. They have great coverage and are much cooler than regular non-breathable plastic pants. They are also very durable and have stood up to many machine washing and still look and work like new. Highly recommended! I bought one pair to see what they were like over my disposable pull ups. I love them! They breathe unlike the vinyl diaper covers which cause one to perspire. No leaks of any kind. I called today and ordered another 3 pair. I can't wait to receive them! First paid was blush and the next 3 are black, white and navy. Bobbie was very friendly, knowledgeable and helpful! I will order again!